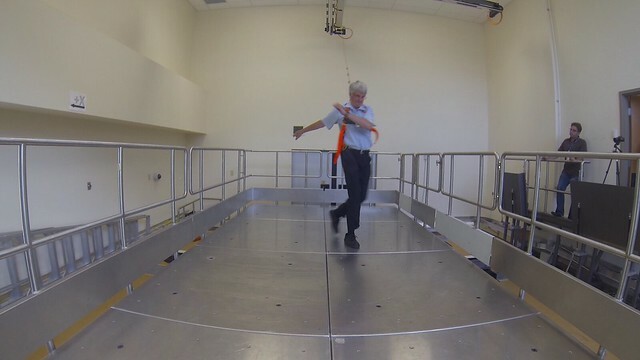 Falls Lab is a motion-platform for studying balance control. This platform is 7 m x 3 m and is made up of 8 large force plates, surrounded by a motion capture system. It allows unpredictable balance disturbances to be applied safely. The platform is used to study compensatory reactions to unexpected perturbations created by platform movements in the horizontal plane. The motion path can be linear in any direction or can be comprised of combinations of different X and Y motions. Subjects on the platform are harnessed but are able to safely move around the lab during tests, allowing for gait or stationary studies. This lab accommodates studies that do not need the full 6 degree of freedom capabilities of the CEAL motion simulator and those that benefit from the longer walking distances, greater availability and lower cost of operation.